Reason for Reading: The very nice Stephanie from Stephanie's Written Word sent me her spare copy, so we both read it and now we are reviewing it on the same day. In the mid–21st century, a young woman in Texas awakens to a nightmare: her skin has been genetically altered, turned bright red as punishment for the crime of having an abortion. Inspired by The Scarlet Letter, When She Woke depicts an American dystopia where terrorist attacks, natural disasters and a pandemic causing infertility have swung the country to the far right, and convicted criminals are “chromed” according to the nature of their crime and then released. A stigmatized woman in a hostile and frightening world, Hannah Payne must seek a path northward to safety. Her perilous journey becomes one of self-discovery and transfiguration as she realizes that faith, love and sexuality are not just political. They’re personal. Mudbound, Hillary Jordan’s first novel (a national bestseller in the U.S. and the U.K. and a local bestseller in Canada), won the 2006 Bellwether Prize and a 2009 Alex Award from the American Library Association. Longlisted for the 2009 IMPAC Dublin Literary Award, Mudbound was also the 2008 NAIBA (New Atlantic Independent Booksellers Association) Fiction Book of the Year. Additionally, it was a Barnes & Noble Discover pick, Borders Original Voices selection, Book Sense Pick and Waterstone’s New Voices pick. This is the first time I have read a book with Stephanie and it was equally fun that she was so nice to send me the book. It was on my list to get as soon as I could, so I was thrilled to get it early. One of my favourite classics of all time is The Scarlet Letter, so when I heard that this one was being compared to it; then I knew I was going to have to read it. I have to say that compared to the other Dystopian novels that are popular at the moment, this is one topic that has always freaked me out a bit. I hate the idea of living in a world where you do not have the right to your own body. That is not to say what I would do if ever faced with an unwanted pregnancy, but I do believe that there should be a choice. I do not believe it should be a crime. So, the Scarlet Letter, The Handmaid's Tale, and other books of the same nature just freak me out. In this book we follow the character Hannah Payne. The world has gone through some troubling times and there was a pandemic that left women infertile. When the cure was eventually found and the population began to increase again, it still left a world of women who would do basically anything for a child of their own. Then we have people like Hannah who for whatever reason decide that they do not want to keep the child they are carrying. On the one hand, I can understand that it is not an easy thing to not be able to have a child and then to have these women who can have children terminate the pregnancy. I just don't think the law should make the decision for them. Just my opinion. I don't really want to start a big debate because I know it is a subject that people are very passionate about. Moving on. Hannah was caught have an illegal abortion. In her society this is illegal and the punishment is a period of time served in jail viewable by the public and then living life as a chrome. Chroming is a sort of best described as skin dye. There are different colours depending on the severity of the crime and then the amount of time you have to live as a chrome is determined by the court decision. Hannah refused to admit who the father of the child was and this meant added time on her sentence. When the book opens Hannah has just woken up for her first day as a Chrome. As the book progresses, though, it has flashbacks to earlier times so that the reader can understand how Hannah became who she is when we first meet her and how she makes the decisions she does in the future. It is a very compelling read because you also get a chance to watch Hannah grow as a person. She has grown up in a very religious community that had very strict guidelines on life was meant to be lived. Suddenly Hannah is a Chrome and treated differently. She has to fend for herself and lots of interesting things happen as a result. Sometimes I wasn't sure if I was going to like Hannah, but she always managed to interest me. This book was a page-turner. I really enjoyed it from beginning to end. There were a few things that didn't entirely work for me, but nothing major. They were meant for the story and so they can't really be faulted. I hope if you get a chance you will give this book a read. I am happy that I did! I liked it and will be reviewing it soon. I agree that it is a page-turner AND that there were some things that didn't really work. I've never read The Scarlett Letter and think I'll have to do so in the near future! sounds fascinating. will have to add this to the TBR; and check out jenclair's review. This book sounds intense! I can honestly say I've never read anything like it and that is usually fun to break out of my mold like that. Thanks for the great review. I find it fascinating and quite unusual that the author has written so different from her last book, which I really enjoyed. 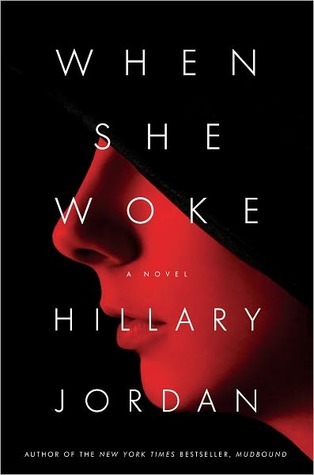 I first heard about When She Woke back when Jordan's first book came out. She did a signing at the bookstore where I worked, and when asked about the next book she just told us it was dystopian, very different from Mudbound, her previous novel. I knew right then I would read it! I loved it, and am glad you did, too. I enjoy books that make me a little uncomfortable and force me to think. So happy that you liked this one; hoping to read it as well. **jenclair: I am glad you liked it, too. I look forward to your review! **Stephanie: I really enjoyed The Scarlet Letter, but it has been years since I have read it. **L: I hope you get a chance to read it and enjoy it! **Amused: Yeah, other than its connections to the original novel, it is in a class of its own. **Marg: I look forward to reading her other book. **Jehara: That's a good word for it! **Erin: Me too. It gets too predictable if you only read 'safe' books. **Diane: I hope you enjoy it! Want to read this one so much!!! Glad to see you liked it. I can't wait to read it! Interesting! I haven't run across this book before--and I'm a big fan of feminist dystopic novels, so it's going on my To Read list. Thanks for the review! I'm looking forward to this one. I loved Mudbound, and I'm looking forward to seeing how Jordan pulls off something completely different. I liked this one too, and thought that it was a riveting read despite a few issues I had with the plot. I've been wanting to reread The Scarlet Letter for a while now (it was a favorite of mine in high school). However, I never thought this book would help expedite things in that regard (of course, I'd never even heard of this book before your review, ha ha). What do you think Hawthorne would have thought about his novel having been the inspiration for some dystopian fiction like this? **Debi: I hope you get to read this! **Anna: I hope you enjoy it! **Kaizerin: It isn't out until October, actually, so that is probably why you hadn't heard of it. **softdrink: I really must request Softdrink from the library. I saw this one on the Amazon Vine program and it caught my attention. The premise sounds really interesting. Nice review. **naida: I hope you get a chance to read it and enjoy it! This sounds like a wonderful read; but it also sounds like I should read The Scarlet Letter first! Nice review!